Guess who loves black pepper?! I can´t believe I´ve done so many posts without doing one on the famous Spanish Paella! Paella traditionally comes from Valencia, up towards the north of Spain, and very good it is too. People think of prawns and mussels when they talk of paella (which here is pronounced along the lines of pie-eh-ya) but there are meat versions and mixed meat and seafood versions, although not many vegetarian ones. If you can buy proper paella rice, it does make all the difference. Use long grain and it won´t be able to soak up all the flavours. Use risotto rice and it will go creamy. Paella rice plumps up, absorbs the flavour but the grains stay separate. 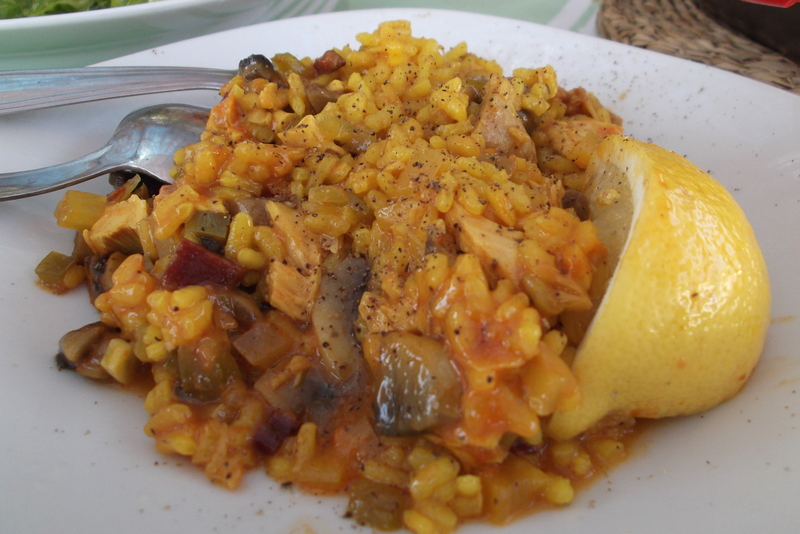 In Andalucía they tend to make more Arroz or Arroz Caldoso, which translates as Rice or Brothy Rice. This is exactly the same as a paella, but with more stock, giving a more soupy dish. Whether you make Arroz or Paella, the technique is the same, it´s just the quantity of liquid that varies. And now, allow me to let you into a little secret. The beautiful colour of a Paella? Saffron? Well, sometimes, but most housewives here use artificial colouring. I was shocked when I found out – perhaps even more than when I realised how expensive saffron is, but I´m just letting you know. I try not to use anything artificial in my cooking, and have been known to slip a little turmeric in, which doesn´t really affect the taste but gives a good golden colour. You can also use paella spice sachets which contain salt, garlic, paprika, saffron and ground cloves….oh, and a little colouring too. There´s no getting away from it. I leave it to you…make your own mix with a few strands of saffron, or use a mix. I won´t judge you! So, here´s how I made this paella. I can´t claim my version today is typically Andaluz, it was a ”what have we got in the fridge?” kind of day. The beauty of this is that you can make it however you fancy. 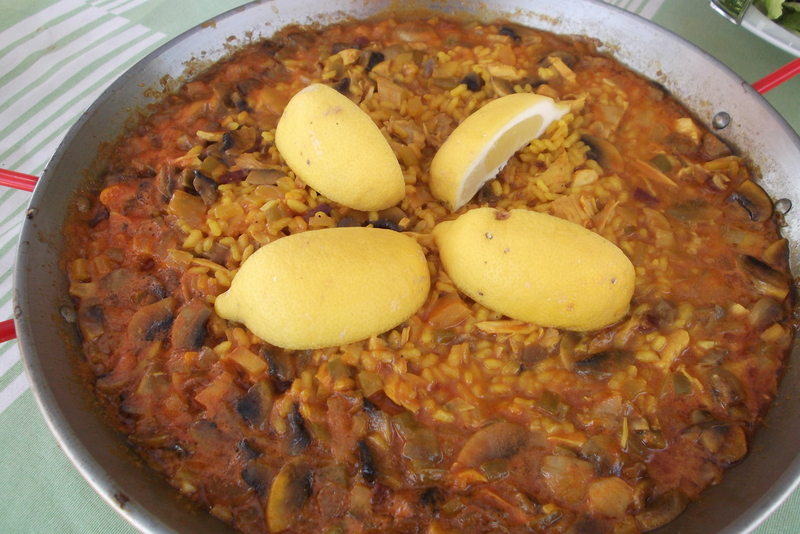 You can make this in a large frying pan if you don´t have a paella pan, or a saucepan if you want to make arroz. The paella pan in the photo is meant to serve four (!). We ate about two thirds of it between the two of us and there was enough left over for a few tapas portions the next day. Soften your onion, celery and pepper in olive oil and then add the crushed garlic. When the garlic has softened, add your pimentón (or chilli powder) and spices and stir in. Now add your tomatoes and cook gently for a minute or two then put your chicken, jamon and stock in and allow to boil. I find that for a paella I use double the quantity of liquid to rice, 3 times for arroz. When the liquid is boiling, add the rice and some seasoning, stir it all around and reduce the heat. I often partly cover the dish with a large lid. You don´t need to stir it like a risotto, some will stick on the bottom, but in my house we fight for those bits! I can´t be more precise about quantities as a lot will depend on how much liquid your rice absorbs. Have a pot of boiling water or stock on the side and if you feel it´s cooking too quickly add a little more. When the rice is almost cooked, but not quite there, turn it off and cover it. Use tin foil or a lid. These last few minutes “resting” are important. Here they say that arroz can be “mal cocinado, pero bien reposado” which means badly cooked but well rested. Hopefully yours will be both bien cocindao and bien reposado! And that´s it, serve with plenty of lemons to squeeze over and a glass of your favourite wine. I´ll do a seafood version soon – my two best girlfriends in the world are coming to stay tomorrow, so no doubt we´ll have plenty of cooking, eating and wine drinking sessions together that I can share with you all! Oh that looks fabulous! Will have to make it when we get home – it will be a warm comfort in the cold weather. Artificial coloring! No way! This looks all natural and quite tasty. Thanks for the tutorial. I know, so disappointing to hear they do that…not in this house though! Have fun with your girlfriends this weekend! I’m having a full house, again, this weekend and this sounds like a perfect dinner! I’ve never perfected my paella making so I’m eager to try this out! Thank you – I´m so looking forward to seeing them! And good luck when you do give the paella a go. It´s really quite straighforward! That looks delicious! Our Spanish neighbour says that the best paella has meat (often rabbit here) AND seafood, but we often make it with what we’ve got in the fridge. And even though there’s a saffron producer very near here, I do use paella spices because saffron is so expensive. I’m looking forward to your seafood versions! Your Spanish neighbour is so right! It´s the most traditional way (and the meat still on the bone but chopped up). I love rabbit and we have some neighbours who supply us occasionally…but often I use whatever I happen to have in the fridge like you! The area of France you are in has a strong Spanish heritage I think? My friend from Palavas certainly has some Spanish ancestors. Yes, there’s a very strong Spanish presence here – hundreds of years of seasonal workers coming for the grape harvest and then decades of people coming here to live permanently for economic or political reasons during the bad years of the 20th century. I’d guess about one-third of the population of our village has Spanish origins, so it makes an interesting cultural mix and the village meal is as likely to be paella as anything, or couscous….and that’s another cultural story! It always reminds me of the song Arroz con pollo. We used to make Paella on the top of the bbq/fire and our fingers used to get all sticky from de-shelling the prawns that were covered in sauce! Will have to ask Big Man about the song – sounds like fun! And as for shellling the prawns with your fingers…well, I think getting mucky is obligatory, it certainly improves the taste of things! Like me – the necessities and the luxuries! If you can find it (and it´s not expensive) it really does make the difference. Aren´t you supposed to be on holiday?! I’ll definitely make this. My hubby doesn’t like the seafood version we always get here, so this will be ideal. Oh yes, you are well placed for the more traditional seafood one. Go for chicken (or rabbit) instead! Brava!!! You are right, real saffron costs a fortune. One of my aunts uses curry to cook her arroz con pollo, and it does taste good. Thank you for the rice tip!!! I don’t know if I will be able to get it in Italy!!! I am going to start looking for the quality of rice you are talking about!!!!! Grazie mille! Mmm arroz con pollo with curry sounds lovely. Good luck finding the rice, although you have lovely rice for risotto where you are! that looks delicious! I’ll have to try this recipe out since my hubby can’t have the shellfish that usually go into traditional paella. Thanks for sharing! I do have a silly question, what sort of jamon do you use? I have Spanish hams available to me here in the States but they are quite pricey. Excellent! I think I can fork over a few bucks for Serrano ham…I can get it at my local grocery here. When I return from vacation the week after next I’ll give it a go. Thanks! Good luck with the paella then, do hope you enjoy it….and the holiday! I love paella and this looks wonderful. I have to try it. Enjoy your blog as well! Do give it a go – I always thought paella was mysterious and complicated….it´s not! I have got to go through your archives! If there are any more recipes like this in there, I will be one very happy forager! Glad you liked it – I was looking at your Pasta recipes last night! Oh and ground cilantro seeds.